Zoom in by mousing over a thumbnail and back to the main image. You may also click on any thumbnail for an enlarged view. Official / Stamped Seat Size: 18"
Seat Size Feels Like: 18"
All Pre-Owned Saddles & Accessories come with a 5-day trial period by default. 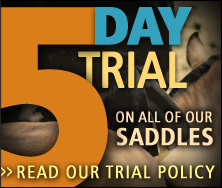 Make sure you read and understand our trial policy. To read these terms and conditions please click here. Tree: Completely adjustable Hennig tree is currently set to a pretty standard medium-wide. Seat: 18" seat is close contact yet deep and supportive with a moderate twist. It measures just 18" the traditional way from the center of the pommel headnail to the cantle. The straight seat measurement is 40.5 cms. For me it sits true to the measured size. Flaps: Average position flaps have the hard to find yet beloved 3/4 length exposed block. They are average length, measuring about 16" from the stirrup bar down. Color: Black with a light grey welt line around the seat and on the stirrup leather keepers. 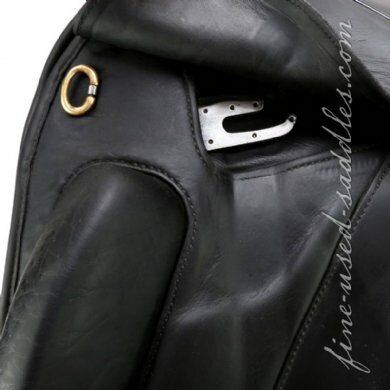 Leather: Finest quality double soft buffalo leather on the seat and block. Doubled luxuriously soft Sofa leather on the flaps and skirts. 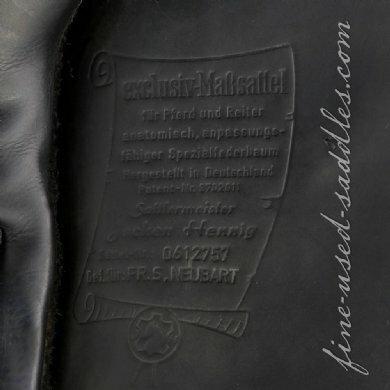 Other fine quality German grain leathers on the lower flap's boot rub protector, sweat flap and billets. Year of Manufacture: December 2006. Panels: Super soft wool-flocked panels have a nice and open 4-5-finger width gullet channel throughout. The tree points are swept back / cut away up front away from the shoulder as is with all Hennigs. The front panel is also sculpted back and away from the horse's scapula for lovely freedom of movement. This style is often called the "Princess Freedom." Condition: Very good, showing just the normal signs of use such as light rubs on the flaps from boots and stirrup leathers with a little more rubbing toward the bottoms of the flaps. The grey piping finish is spotty on stirrup leather keepers but you have to be looking closely. It just got brand Hennig new billets installed. Lovely saddle, lovely grippy leather. This is a wonderful and supportive German-made Hennig saddle in beautiful condition. Hennig saddles have been designed for horse/rider comfort, harmony, balance, security and excellent contact. This saddle has the awesome Hennig Sofa tree with a pressure relieving cut-out in the twist area and two cutouts under the seat bones. 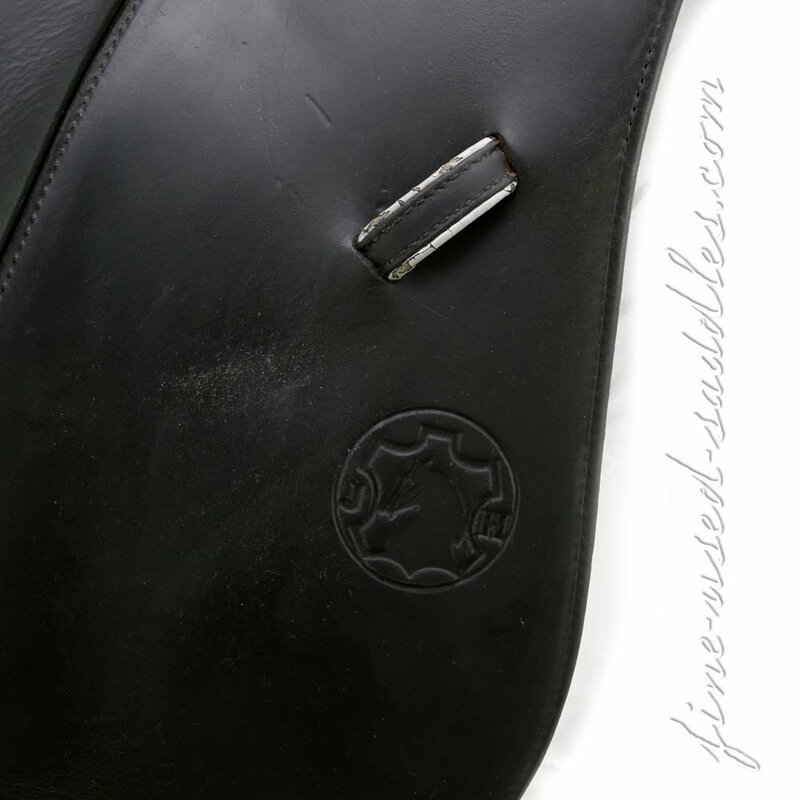 The tree points of Hennig saddles are swept back inside the saddle, which is an awesome feature for those big movers and for generally large-shouldered horses. The front panel is also nicely cut back for shoulder freedom and comfort. This saddle comes equipped with two center billets, ideal for a horse with a large shoulder and straighter girth groove. Cost New: Around $6,500 or more - with a wait and without the ability to try the exact saddle you are buying. 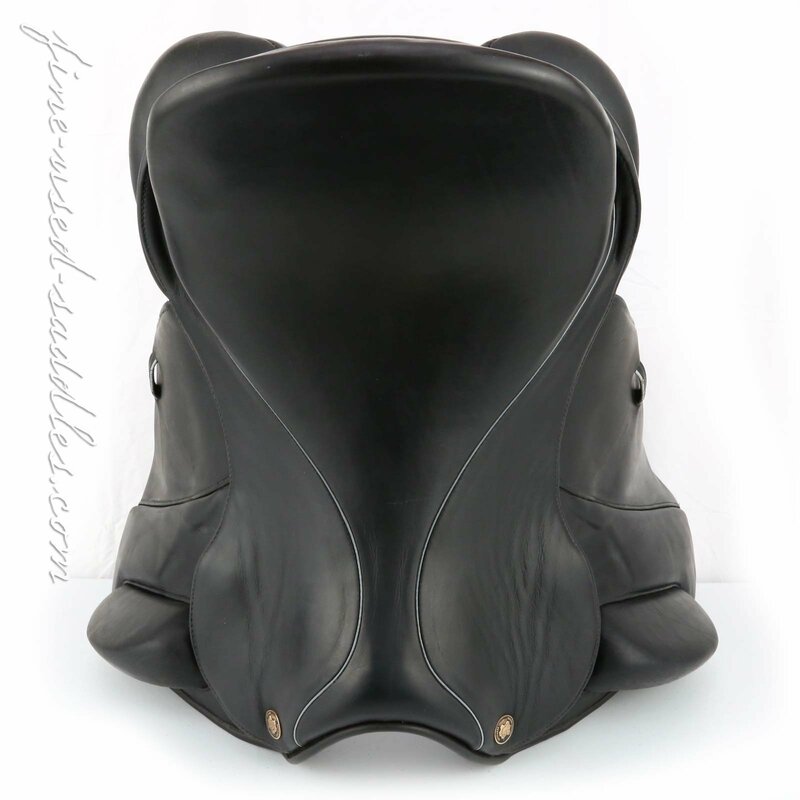 All contents of this web site © Fine Used Saddles 2019. Saddles in this category will show very little to no use. There will be no color variation, no fading of leather, no scratches, dings or damage anywhere. The billets will typically show some light creasing. The flaps may show faint marks. Saddles under this rating will have only very light and normal wear. You will see light rubs on the flaps. Occasionally you will see extremely light seat edge rubs. If there are any surface scratches or nicks they will be very small and superficial. The billets will be in good or better condition. Any color variation present will be subtle. There may be some very subtle color fading, but usually not. A saddle in excellent condition has been lightly used and has been very well maintained. 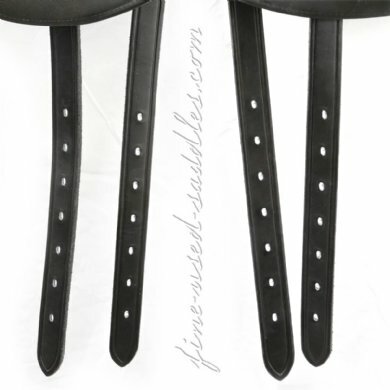 Saddles in this category will typically have light to moderate rubs on the flaps from boots and stirrup leathers, usually with more rubbing toward the bottom of the flaps. There can be minor color variation on the leather from sweat, rain, or general wear, often on the flaps but usually on the seat and panels. These saddles may have some visible but minor seat edge rubs. Light creasing on knee pads is typically seen. A few minor surface scratches or nicks in the leather may be present, but always superficial and never deep. Billets can show moderate wear. A very small spot worn through the leather on one or more of the blocks is permissible for this rating, but only if the blocks exhibiting this are underneath a flap. Completely serviceable condition with moderate wear but no repairs needed. No holes or cuts in the leather that go all the way through. These saddles will have significant rubbing on the flaps. Typically there will be creases on the knee pads, sometimes deep creases. Often you will see friction rubs at the seat edges. May have surface cracks in the leather, usually fine and superficial crazing, often found on the seat and panels. You may or may not be able to feel this crazing to the touch. Saddles in this category may show fading of color or significant color variation from sweat, rain, or general wear. Billets will typically show a lot of mileage, but must have some good life left in them. Surface nicks and scratches may be present. There may be a small worn through spot on one of more of the blocks, but is acceptable only when the blocks in question are underneath a flap. Saddles under this rating may need significant repairs. They may have spots worn all the way through the leather (deep cuts) in the seat, flaps, knee pads or elsewhere. These saddles will often have significant cracks and leather may be dry. May have severe discoloration or fading of leather. May also have any other cosmetic issues mentioned below under 'Good Condition.' FUS usually cannot accept saddles that fall under the fair condition rating but we may be able to help you with repairs to bring these saddles to sellable condition. This is the most traditional method of stuffing a saddle's panels. There are many types of flocking that saddle fitters will refer to as wool. They range from a slew of different synthetic fibers to an array of natural sheep's wool. There will always be debate and no concise agreement on which type is better, but the higher end saddles we carry are generally going to be stuffed with the best of whatever type is used. Wool flocking does require maintenance. It can harden and ball up over time and will after several years (and sometimes less) need full replacement of all the wool inside. When used on one horse, wool tends to mold to that horse's build over time, so it CAN be harder to use these saddles on multiple horses than with the other two types, though that is not always the case. The great benefit is that it can be easily tweaked by a saddle fitter. When buying a used saddle, sometimes they are perfect right out of the box but you should count on the possibility of needing an adjustment in order to achieve that custom fit you want. That is a completely normal scenario. Some wool flocked panels will also have a foam or felt lining as a buffer between the wool and the panel surface which contacts the horse. Examples of these are Hennig, Amerigo and Prestige. This helps ensure a smooth surface on the horse's back. 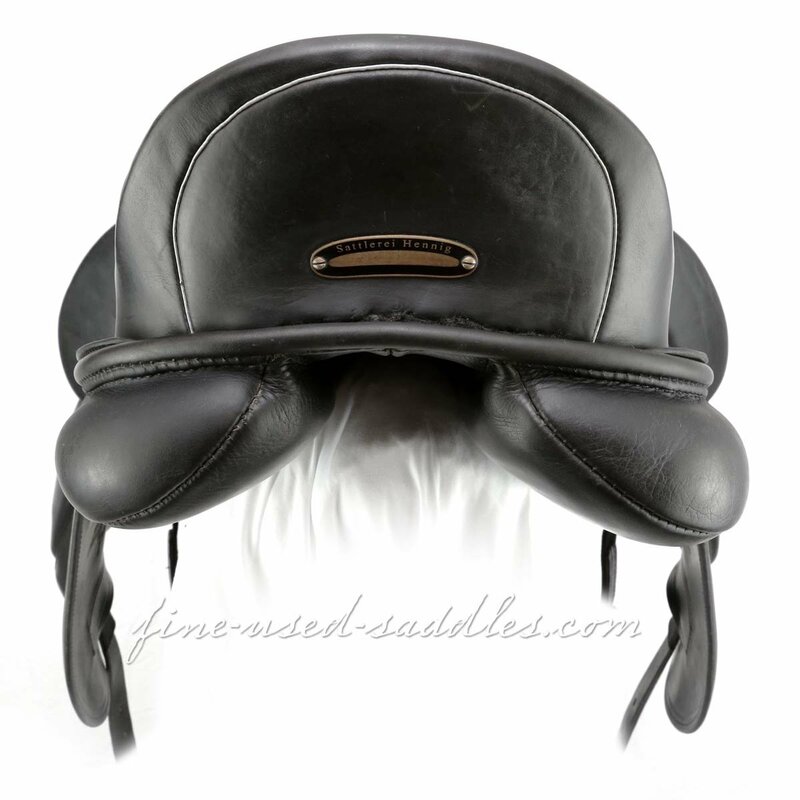 A complete reflock and replacement of wool in a saddle in the USA generally ranges from $200-350 and requires the panel be dropped and resewn, usually at the saddle fitter's shop. Tweaking of existing wool ranges from around $75-300, with a huge range in cost due to varying barn call fees. Simpler adjustments, which generally involve adding wool to certain areas and sometimes removal from other areas is what is typically done on site. Most our our Dressage saddles are wool flocked. Foam versus wool is simply a trade off. 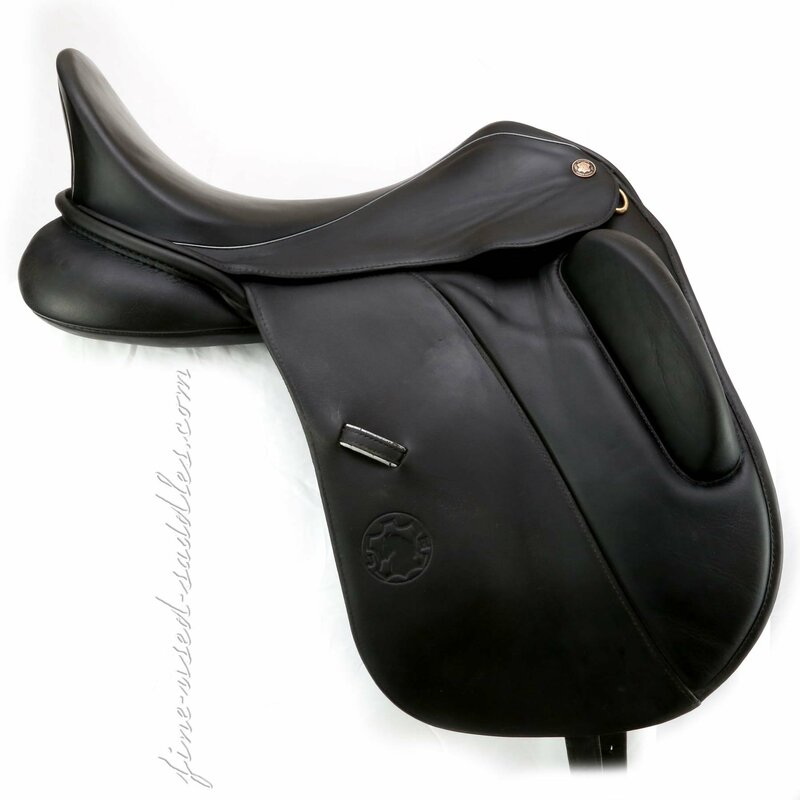 Foam is resilient and pretty much zero maintenance as long as the saddle fits your horse. You can get the closest contact possible with your horse. It does not harden or ball up and most types take hard use over many years before they begin to break down. You can use these saddles more easily across more than one equine because the foam does not mold to the animal and stay there. It does mold to the horse but it bounces back to its original form. There is no settling with foam. It is what it is, basically. The downside is that though adjustments are usually needed less frequently they are a bit more complicated. In some cases in order to change the fit for big changes or for a different horse, the original panel can be shaved down in certain areas. In other cases where the panel needs areas more built up the original panels are completely discarded and new ones are sculpted. The foam saddle needs to fit right out of the box, but another upside is that they are often easier to find a fit across multiple horses. Almost every French saddle is going to be filled with foam. In the high end saddles we carry, this foam is the best of the best in latex panels. Foam flocking is the French tradition, while generally wool is the English / German tradition. One exception I can think of is Lauriche, an English made saddle which is always originally made with foam panels. The cost to have foam panels adjusted or re-fit ranges anywhere from $250-$900 depending on who does the work. Independent saddlers charge less than the original saddle brand's shop, but independent fitters specializing in foam are harder to find in the USA than in somewhere like France. Foam flocking is also commonly seen in jumping saddles which are not French in origin. Traditional fitters specializing in wool are typically not big fans of foam because there is not a whole lot they can do with it other than shimming with felt. There are two main types (really brands) of air flocking systems. One is "Cair," which we find in the Bates and Wintec saddles. It is pretty firm in our opinion and is not known to be adjustable. "Flair" is the other type, which is what we see here at Fine Used Saddles. Air is yet another trade off. Each type of flocking has its own advantages and pitfalls. Flair panels are highly adjustable and absolutely excellent for pressure distribution on the horse's back. The panels can be made very soft or more firm depending on your needs. 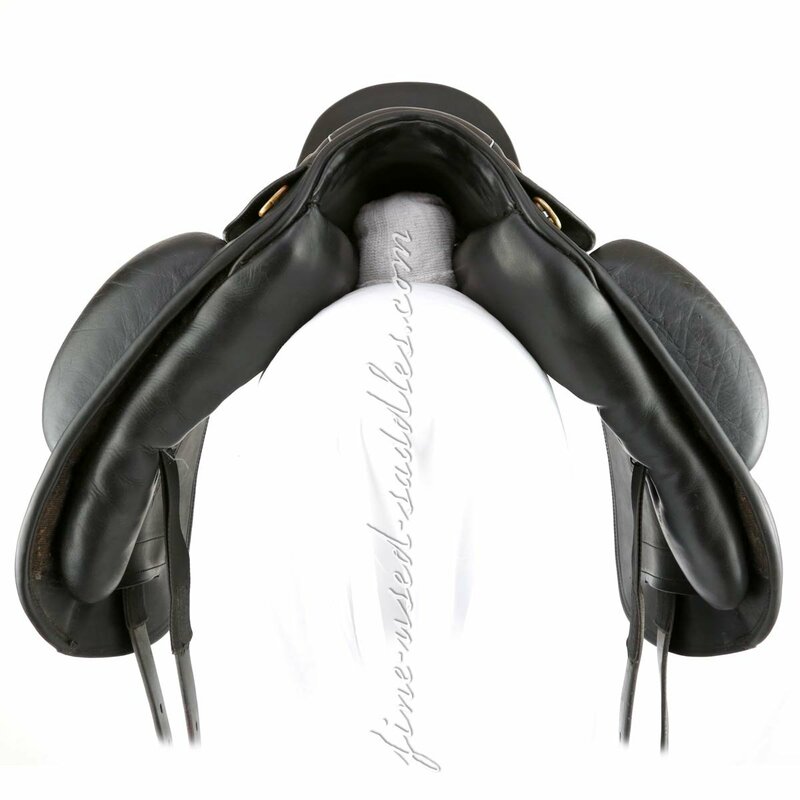 The Flair system consists of four total air bladders, two in each side of the saddle.. The air will move and flex with every movement of the horse. They do provide a completely different feel for horse and rider. We've found that riders will either love or hate them. There is a springy feel to the ride, which does vary depending on how the saddle is adjusted but will always be there. Some feel a trampoline-like affect. It can take some getting used to, and that's one of the biggest reasons we think we don't see it everywhere despite it being excellent for the horse's backs. Some horses will need time to adjust to the different sensations but in my experience most love it and can become completely spoiled to Flair. In some climates the expanding and shrinking air inside the panels can result in seasonal changes in how the saddles fit. Slow leaks can develop and put people off of Flair, but we've found this to be a pretty rare issue. Finding saddle fitters to adjust Flair panels is a little more difficult than wool, but easier than for foam. The Flair kit consists of a few tubes and an air pump - pretty simple - and in our opinion can be learned easily by brave amateurs. Every manufacturer has a different system for tree size. It is not just the actual width and spacing of the tree points that make up a saddle's tree width. It is also the shape and the angle of the tree opening, along with panel thickness and shape. Though we will always mention the "official" or stamped size regarded by the manufacturer if applicable, we sort saddles online according to a more generic system for the sake of consistency. Our goal is to ease confusion as well as we can. If your horse fits a medium-wide according to the stamped size in one brand it is unlikely that a medium-wide will work in all brands stamped that size. We rely on the Bates gullet gauge along with expert visual assessment to asign saddles a tree size and fit for description online. Many riders are familiar with this gullet system so it's become the closest thing to a gold standard we can find. Since shape also influences the overall size, this system still isn't perfect but all across the board it probably never will be. This is the closest we can get! Inconsistent tree sizing and fit across all saddles is a huge reason we advocate second hand saddles. When you buy second hand you are trying the EXACT saddle you are looking to make your own. There are even variations in tree fit frequently seen between two saddles from the same maker despite showing the same stamped size. Even with a saddle being custom made for you and your horse you don't know what you're getting until you've got it. The picture in your mind may not match what is delivered and we see that happen all the time. Saddle fitting is both an art and a science. It can so often just come down to trial and error, but we do everything we can to help you navigate the grey areas. Entering an amount here simply gives us an idea of your goals. It does not necessarily mean that we will aim to sell your saddle to clear you exactly what you enter here. Once we review your application we will discuss pricing with you one on one (usually via email) and will let you know whether we think you are aiming too high or even too low. After your saddle has been received by FUS and reviewed in person we will further discuss and confirm the actual listing price with you. What you enter here will also help us determine whether we will be able to help you. If you are demanding more than the market will bear, we usually will not accept the saddle in question for consignment. We always want to feel confident that we can sell a saddle to the owner's satisfaction before agreeing to take that saddle on. If you don't have a goal or just don't know where to start, you can let us know that in this box. We won't force you to enter a number at this stage. 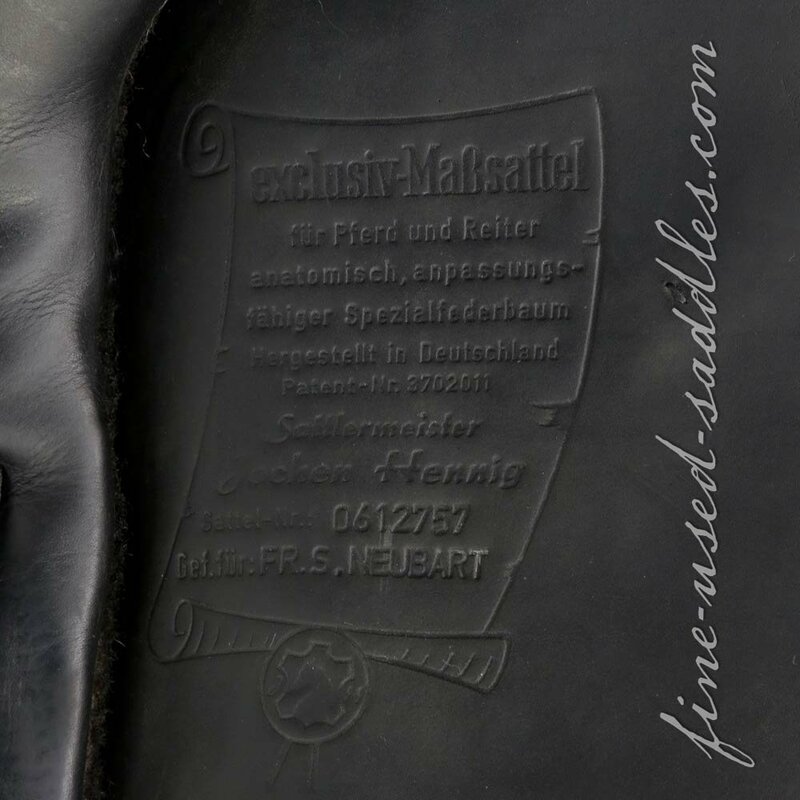 Most saddles have some info / codes stamped into the leather, usually underneath a flap. This stamped info can often tell us many facts about your saddle, often indicating its exact age. Knowing this info can be very helpful to us in estimating a likely selling price range before actually seeing your saddle in person, so please include it if it's not too big an inconvenience for you. Our consignment fee for saddles is a flat 25%. The consignment fee for accessories (girths, leathers, irons, saddle pads etc. when accepted) is 40%. We will usually only accept fittings from customers also sending in a saddle unless multiple high end non-saddle items are being sent. 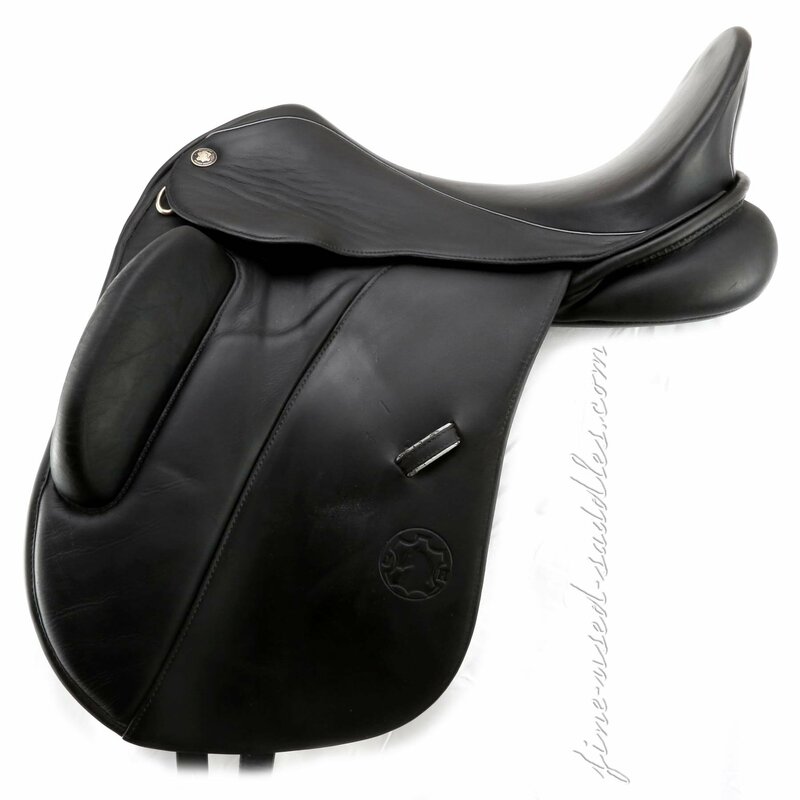 We can only accept brand name fittings of a quality similar to that of our saddles, and in good or better condition. Every saddle is inspected by Fine Used Saddles for tree soundness and other problems that might make a saddle unsafe, unfit or in condition not acceptable for resale. If we find a repairable problem with your saddle we will consult with you having it fixed.. Otherwise, it is possible the saddle will need to be returned to you at your expense. Side note: We've only had to do this two or three times over several years. 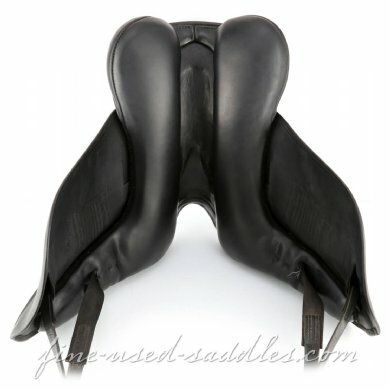 Each saddle sold on consignment must have good, safe billets. Consignment saddles must be reasonably clean and in good condition or better. Condition ratings are at the discretion of Fine Used Saddles. The leather must have no rips or tears. We reserve the right to reject any consignment application. We reserve the right to also reject saddles once received if we deem them to have been misrepresented on the consignment application. Every saddle we offer comes with a 5 day test purchase period in which customers are allowed to try on and ride in the saddle. The shipment time is not included in this trial time frame and we may give clients a few extra days if needed, at our careful discretion. A full credit card authorization is collected and customers are responsible for any damage done to the saddle over the course of the trial. Within 15 business days of the confirmed sale of your saddle we will send you a check by mail to the address you provide for the sales price minus commission. Before mailing, we will contact you to verify your address and let you know your check is on the way. Your saddle is insured every time it is shipped for trial. To use this powerful new feature you must first create an account and be logged in. If you are logged into your account you can click this link to edit, delete and execute previously saved searches. You may also access your personalized searches from the "Manage Saved Searches" link in "My Account". From there you may also create new saved searches. Our system will email you every time a prospective match to your personal criteria is listed. Searches will not be saved if you are not logged in at the time of the search. You must create a free account and be signed in to use this powerful new feature. Only your name and email address are required - the other contact information fields are optional. If creating a new account or logging in from THIS link, your search will not be saved. You will have to run the search again to access the "Save this Search" option. 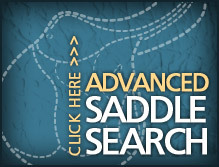 Then, when we list any saddles meeting your criteria, you will get an email notice. You can save as many searches as you like and can be as specific or as general as you like. You can also access your previously saved searches from the "Manage Saved Searches" link in "My Account". There you can add new searches, edit old ones, delete them, or execute them to see currently available results. We highly recommend NOT using the strict search feature for saved searches so that you won't risk missing a good possibility. However, it can be helpful to narrow things down for you in a live search. The "fuzzy search" is our default searching option. This means that whatever value entered, the results will also show you the next closest values. For example, if you search for a 17 1/2" seat size, it will also show you those that fit just a little small in our opinion (17 1/4") and those that sit just a little big in our opinion ("17 3/4"). The same goes for all other criteria. If you search on "Medium-Wide" for tree size, results will be returned that are in between medium-wide and medium, and between medium-wide and wide. But the listings will always specify whether it is a straightforward medium-wide, etc, or somewhere in between. If you are searching for a particular model name or feature you can enter this into keywords, but be careful to watch your spelling. If you have any questions about these new and comprehensive features do not hesitate to contact us for guidance. We don't want you to miss out on anything!